Join the Take the Lake Volunteer Crew! 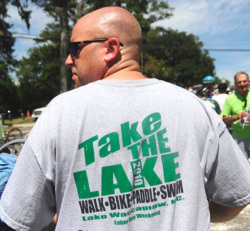 Take the Lake has quickly turned into a sizable event, with an expected 1,200 participants this year, and a whole lot of opportunities for volunteering fun. Below is a (chronological) list of 14 areas in which we really could use some help. Pick one or a couple, and then give us some contact information at the end. Please know that you are not really committing yourself at this point, just showing interest. We'll contact you as the event nears and you can let us know at that time if your schedule is still open. OK? Good. Just call me when you need a hand! We need to get the word out, and you, our advance forces can help! Please help us hang posters in storefronts throughout your town, or in your workplace or worship–place, or school, etc. It's a nice hike, and you meet a lot of people. Come join us! 3. Take the Lake X-TREME! TTL X-TREME! 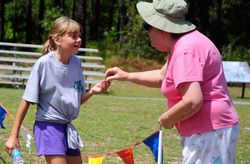 participants complete all four Personal Endurance Challenges in a single day, so we need support volunteers. Most of the help will be needed near Dale's Restaurant, where most of the PECs start and finish. 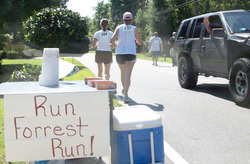 We'll need to record participants' times, and provide help where we can. For everything else, these athletes will pretty much be on their own. I'd like to help with TTL X-TREME! We have banners and signs, and all kinds of odds and ends that need to be taken care of, and Harry Foley is just the man to take care of things. Want to be on his crew? Check the box! Sign me up for the sign crew! Water is the lifeblood of Take the Lake, and we give our Walk / Run and Bike & Hike participants cold water every mile, on the mile. We need a small crew to deliver it. Want to be a vital part of TTL? 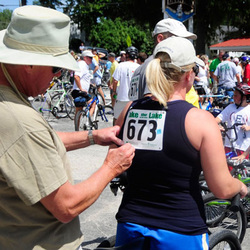 There is always a bustle of activity about a half-hour before each Personal Endurance Challenge, as hundreds of people show up and sign up and pick up their numbered bibs. Things should be easier on everyone this year as we are accepting online waiver "signatures," but it's usually an exciting time, so join the party! 7. We flip for fruit! Our fruit cones - fresh, cool fruit packed in a waffle ice cream cone - are a hit, and you could be the most popular person around! We need someone to buy the fruit, cut it up and serve it. We have an ingredients list, and donations pay for them, so you just do the (fun) work. It sounds simple, really. We use computer software to record every participant's time as they cross the finish line, but we have four PECs with hundreds of participants, and it's very important that we don't mess this up. So, we think this will work best if a group of people would take charge of the whole timing system. The software is very easy to use, but the task is complicated a bit since we'll match up registration information for each participant. Any business, organization or other group that could roust about 3-4 people for that weekend would enjoy tremendous status as the Take the Lake Timing Team. You also get to hand out the JAMAs -– awesome little awards that everybody's collecting -– and you will see more smiles each day than you usually see all year! Sunday: 7:30 a.m. – 5 p.m.
T-shirts. Everybody wants them, and we'll have hundreds of them to sell. This is a great way to be the center of attention Saturday and Sunday. We need help for several hours, and it would be great to have the same people. This really is a vital part of Take the Lake, and we need your help! 10. Party at your place! 1. The Street - As walkers pass by Saturday morning, or cyclists Sunday afternoon, hand them some water or light snacks or something. It's fun! 2. Front Yard - Make up cheer signs to encourage participants. Or promote your church, school organization or even business –- the more, the merrier, and, heck, tacky isn't so bad either! 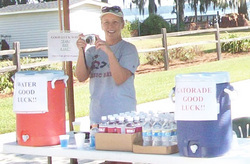 These signs distract our participants and help them achieve their goals. 3. Back Yard - This is where you throw the party. Invite your family, friends or coworkers -- it's a great time for reunions of family, college, military friends or any group. The bigger your party, the more potential participants for us, so think big! 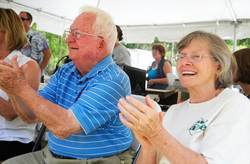 Don't forget the paddlers Sunday morning - they need cheering, too! And don't forget about this year's "THE ART OF FITNESS" theme, so spread the word throughout your yard to celebrate artists of all media. 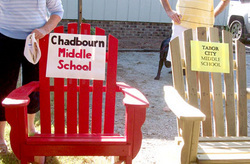 Chadbourn & Tabor City middle schools offered comfy chais for quick rests - greatly appreciated! 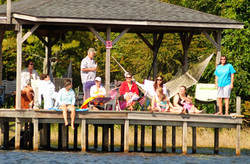 Take the party out back Sunday morning and cheer 100+ paddlers as they pass by! No need to sign up for this one; just rally your fam, buds & coworks, and party! 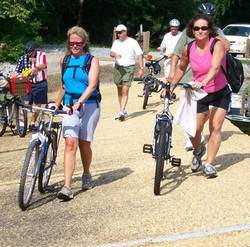 The dam crossing the Waccamaw River wasn't built for bicyclists (or even walkers) to easily cross it, so we build a simple ramp and "bridge" for our Bike & Hikers and Run / Walkers. But it's still tricky, so they can use a little guidance and helping hands. We have been fortunate to have a dedicated crew here, but even they can use a little help. On Saturday, we just need people to say "watch your step" a few hundred times, and to help anyone who needs it. But Sunday is a little more of a challenge. Steve Smith has done this a few years, now, and he said, "I've never been thanked so much!" Steve will head this up, but you are welcome to help. 12. Paddle Patrol - Join the Take the Lake Navy! During the Paddle and Swim Personal Endurance Challenges, we really like to have as many "friendly" boats on the lake as we can. So sign up to spend a nice day on the water. We rarely have trouble, but if we do, you'll be there to help, or to make a quick phone call and get help! Be the pot of gold at the end of the rainbow! This will be great fun, as you will be the person people see after completing their Personal Endurance Challenges, and you'll give them water, snacks and a big smile! This is both a volunteer and a sponsorship opportunity, as we need businesses or organizations who will "take over" this important part of Take the Lake for us. We figure you will need to spend about $150 - $200 on drinks, snacks, fruit, etc., and for that you will receive sponsorship status and the media exposure that goes with it. Welcome to the TEAM! Thanks for showing your support as we support fitness for Columbus County! We know you've probably already given us all this information (below) if you you signed up to participate, but we'll need it over here, OK? And we really do need it, because we'll have to get a hold of you to discuss your (very fun!) volunteer opportunities. We'll likely just contact you by email or phone, but please include this so we can mail you things if we have to.